Workers on a standard gauge railway (file photo). Kenya was Tuesday putting on a brave face following reports that Uganda had shelved plans to extend the Standard Gauge Railway from Malaba to Kampala until "unresolved issues with Kenya and China have been concluded". Transport Cabinet Secretary James Macharia said that Kenya was instead revamping the Kisumu Port in Lake Victoria to ease movement of goods via the lake to Uganda and Rwanda in case the SGR terminates at Kisumu. "In the worst case scenario, the Kisumu port would serve Rwanda and Uganda. We are, however, moving phase by phase. Thinking about Malaba for now is too much for the plate," Mr Macharia said in an interview with the Nation. Mr Macharia is currently in China to conclude negotiations for funding of the Naivasha to Kisumu SGR sector. 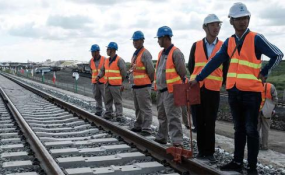 Kenya secured a Sh150 billion loan from China to extend its railway from Nairobi to Naivasha and construction is ongoing. The Mombasa -- Nairobi SGR line was completed mid-last year. Uganda Finance Minister Matia Kasaija told Daily Nation's sister publication, the Daily Monitor, on Monday, that the Uganda government had put on hold the SGR venture and has instead turned attention to revamping the old metre-gauge railway network. The Chinese-financed project is the first stage in a scheme that aims to extend to Uganda and other landlocked countries. The goal is to cut the cost of transport and boost trade by replacing a slower, narrow-gauge line. For some time now, Ugandan government officials have blamed Kenya for failing to commit themselves to financing the remaining two -- Naivasha-Kisumu, and Kisumu-Malaba sections. Kenya's non-commitment, according to sources, is mainly debt concerns, but also the fact that there is little economic activity in Uganda to justify such an investment. "It is apparent the SGR is going to take us a lot of time to complete. First, we have to wait for Kenya to reach at the Malaba [border] point then we can start," Mr Kasaija told the Daily Monitor Monday. Mr Kasaija was quoted saying the Uganda government, in the interim, is refurbishing the old railway line as "an alternative" to lower transportation costs for traders. Uganda's first phase of SGR, the eastern line running from Malaba to Kampala, is about 273km and is expected to cost about Sh234 billion. Mr Kasaija said that Uganda has currently taken a back seat on the SGR venture, but will resume "serious discussions once Kenya is about to reach" the Ugandan side. He said that during the discussions in Beijing, it was agreed that "Uganda and Kenya will embark on joint financing negotiations" after Kenya has completed the current Nairobi-Naivasha section.